Queen duvet cover (88" x 88") featuring the image "Horyu-ji Temple Pagoda B W - Nara Japan" by Daniel Hagerman. Our soft microfiber duvet covers are hand sewn and include a hidden zipper for easy washing and assembly. Your selected image is printed on the top surface with a soft white surface underneath. All duvet covers are machine washable with cold water and a mild detergent. 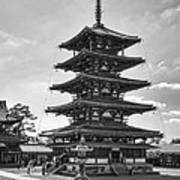 There are no comments for Horyu-ji Temple Pagoda B W - Nara Japan. Click here to post the first comment. 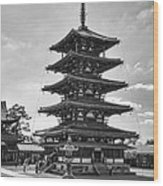 There is no other Pagoda like this one. 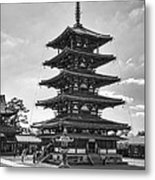 It is widely regarded to be one of the oldest wood structures in the world. The old-growth cedar center pole was determined by analysis to have been felled in 594. There are no nails, bolts or other modern fasteners holding the structure together. The finest joinery and materials have kept it standing down through the centuries despite location in one of the most sysmically active countries on earth. The pagoda is quite flexible although each story rises with accumulated tonnage. 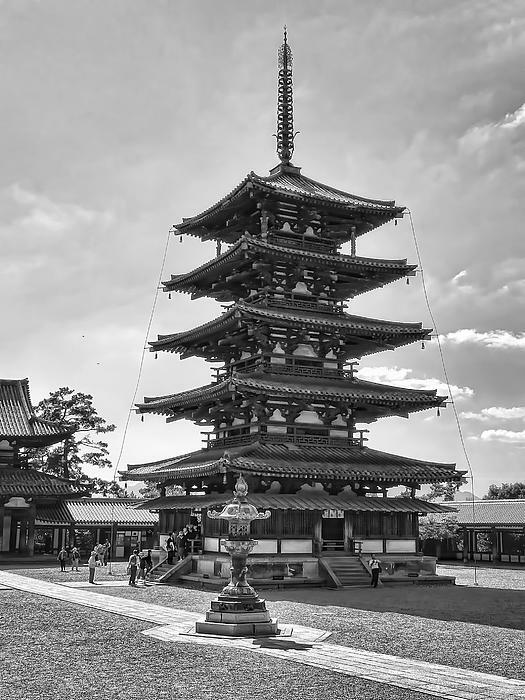 It is a UNESCO World Heritage Site and a Japan National Treasure.